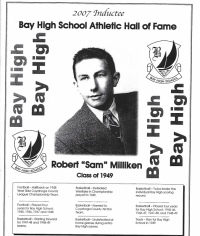 Sam Milliken was inducted into the Bay High School Athletic Hall of Fame in 2007. We are fortunate that there are many stories filled with memories catalogued in the Osborn Learning Center. 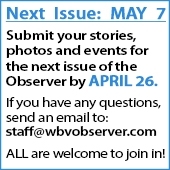 This story comes from Robert, nicknamed Sam, Milliken from the Bay High School Class of 1949. In December 1937, we moved to a three-room “summer” cottage on East Oviatt Road in Bay Village. The cottage consisted of a kitchen, living room and one bedroom. My parents had to literally drag us three kids – Irene, Ron and myself – as we had really enjoyed the near west side of Cleveland. We had lived on Bridge Avenue for about there years and were comfortable there after having moved around the eastern states for the prior two-and-a-half years. During those Depression times we had lived in 25 different cities. To sum it up, we didn’t want to move again. The cottage had a “sun porch” which served as Ron’s and my bedroom. Irene’s bedroom was a small enclosed rear porch. There was no insulation. The plumbing provided the kitchen sink with water which drained into a five-gallon bucket and had to be carried outside to be emptied. Heat, what there was of it, was provided by a kerosene stove in the living room and a gas cooking stove in the kitchen. It was a very cold winter and I don’t recall being warm until that following spring and summer. By the way, the house did not have indoor plumbing We had an outhouse. My parents purchased the home on a land contract for $1,500. Payments were $15 per month. Over the years, my dad added two more bedrooms, a bath, and expanded the living room. Subsequently, he moved the house forward over a basement and Richie and Gayle joined the family. We survived the winter and I can attest that we fell in love with Bay. We discovered the woods, the creek, the ball fields and the beaches. Bay had a great school system and proved to be a great place to grow up. There were seven boys that lived in the area of Lake, Glen Park, Cahoon roads and the railroad tracks. The boys in the “hood” were known as the Depot Boys as the Dover train station and the RR Section Shanty were at Dover Center. The boys were rather mischievous, and in that regard, Ron and I led the way. Terry Gillespie was older and a fine athlete. We idolized him. Hubie Gillespie, Bill and Jim Zipp, my brother Ron and myself with the Westlake (or Dover) boys – the Micheliks, the Deitricks, the Canpanas and the Moormanns – made up the gang. We played ball in Zipp’s field across from Sylvesters, and later at the baseball field at Cahoon Park. We played every day, even in the rain. We played basketball in the woods. The backboard was nailed to a large oak tree and the floor was rich, dark, hard-packed soil which would cover the ball and subsequently our hands, face and clothes. The latter proved to our mothers that maybe football was a better sport. We built tree houses in the woods and rafts out of drift wood. We ice skated on the unfinished Osborn Road, between Glen Park and Dover, and also on the creek. As we got older, we used the pond behind city hall. Sled riding was behind the fire station at the Community House. From the top of the hill, if the snow was really packed hard, we could make it across the Cahoon reflecting pond to Cahoon Creek and almost to the waterfall on the north side of Lake Road. On the east side of the valley, we could sled down a gentle slope and on occasion make it across the wooden bridge of Cahoon Creek. We warmed at the fire station furnace and in the basement of City Hall. The memories of those carefree days can never be forgotten. I’m glad my parents had the foresight, the determination, the fortitude and the courage to move to Bay. They gave us a wonderful childhood. Incidentally, the “Depot Boys” did pretty well in life. Bill Zipp worked with his dad at Zipp’s Manufacturing, Hubie Gillespie retired as a fire captain with the BVFD, my brother Ron was a policeman in North Olmsted, Jim Zipp retired as the chief of police of Lake Zurich, Illinois, and I am still involved in the law enforcement profession after 40 years. I imagine that quite a few people would have never, in their wildest imagination, thought that most of the “Depot Boys” would be involved in the public safety profession.